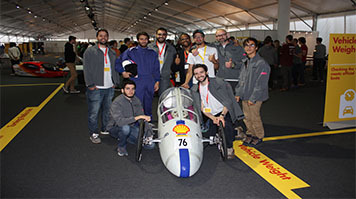 After a year of preparation, a team of LSBU’s brightest engineers competed with thousands of others from around the world in the Shell Eco-Marathon Europe 2016. With the guidance of their lecturer Silvio Lavendeira and Project Lead Tony Roberts the team designed and delivered their vision of a super-efficient vehicle, the ‘Hydro-Machina’, to compete in the concept class of the competition. The Shell Eco-Marathon dates back to 1939 when Shell Oil Company USA employees made a friendly wager over who could travel furthest on the same amount of fuel. Since then it has expanded to include competitions on three continents featuring different energy classes. LSBU competed in the European leg of the competition that saw the green-wheeled cars take to the streets of London. Project Lead Anthony Roberts said, “At LSBU the philosophy of learning by doing is ingrained in so much of our curriculum that when an exciting opportunity like the Shell Eco-Marathon comes along it’s only natural to want to get involved. This was the first time LSBU's School of Engineering competed in the fuel-efficient marathon and already the team are gearing up for next year’s event, where they will reveal their new vehicle “Something Good 2”. See all of the highlights from the 2016 Shell Eco-Marathon Europe and find out more about studying Vehicle Engineering at LSBU.